This is a freeware as useful. It provides AAC/MP4 audio encoding as graphic user interface shell. You can lunch program by double click on Explorer that select NAACES.EXE. And explore your favorate musics (wav , mp3 , ogg). Drag and drop music files to NACCES. 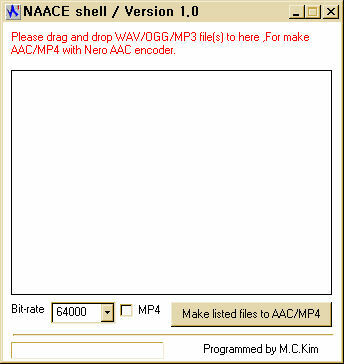 When it made file list , and you've been ready to make AAC audio file , Just press encode button ! If it be checked , MP4 check box , encoded file extention named as MP4 instead AAC.